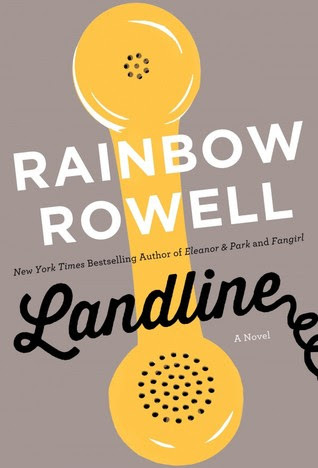 Landline | Bookish Thoughts – my books. my life. Georgie McCool (yes, that is her name), a television comedy writer, is about to get her biggest career break yet, but her personal life is falling apart. Her husband, Neil, has taken their daughters to Omaha for Christmas, leaving Georgie home alone in Los Angeles to work. When she plugs in her old telephone at her mother’s house to call her husband, she finds Neil – in 1998 – on the other end. So, I love Rainbow Rowell. But what I love about her is the way her books feel so real and this concept is so ridiculous and unrealistic that it just didn’t work for me. And, aside from the magic phone concept, how is it possible that Neil wouldn’t call his wife for an entire week DURING CHRISTMAS? And, why wouldn’t the plan be for her to fly in for Christmas day? On top of all of that, the characters were not very likable. I didn’t really like Georgie. I wanted to shake her, tell her to stop whining, put on some of her own clothes, and DO SOMETHING. And Neil needed to stop being a martyr and DO SOMETHING. Basically, I just wanted someone to do something and it took a really long time for that to happen. But I’m still giving this three stars because even subpar Rainbow Rowell is better than most anyone else. I will not hesitate to read more of her novels in the future. The way she captures parenting in Landline is truly fantastic. Agreed! She really describes parenthood perfectly in this one. The premise is totally ridiculous. I didn’t like any of the characters AND I was convinced that this was all happening because she had died or her family had died and that she or them were stuck in limbo. That seemed to be the only way it could work but man, what a downer that would be.